The Enjoy Local range is produced by 20 local suppliers. Meet some of them below. Ever wondered why our enjoy local range tastes sooooooooooooo good? We scoured the country & found 20 of THE BEST local suppliers who shared their secret recipes with us & helped us develop an award winning range that’s made with love. 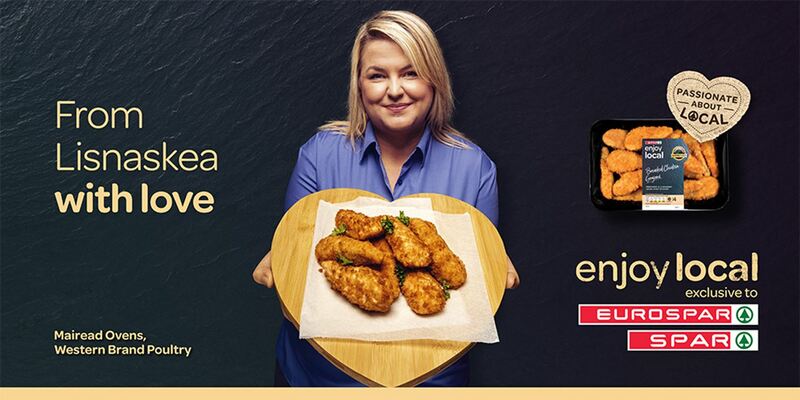 From Lisnaskea, we supply both ready to eat and breaded chicken products into SPAR stores working in accordance with BRC and Bord Bia codes of practice. Striving to achieve the highest quality and maintaining high food safety standards is of the upmost importance to us. The material we use for processing comes from our sister site in Ballyhaunis, County Mayo so it’s local, fresh and we know its high quality. For our breaded range, we have worked very closely with our coating supplier to develop a breadcrumb made from tin baked loaves, which gives the product a natural colour variant throughout, as well as providing a great crunchy homemade texture. How long have your products been on the shelves of SPAR & EUROSPAR? Our Products have been in store since June 2014, starting with breaded chicken steaks and breaded chicken nuggets. Since then, we have added breaded chicken goujons as well as ready to eat chicken breast products, including whole cooked fillets, slices and pieces allowing for a hassle free, convenient option. What’s your favourite meal to make with your products? My favourite meal to make with our products is chicken carbonara using our chargrilled chicken slices. The smoky chargrilled flavour really compliments the creaminess of the sauce and because the chicken is already cooked, it’s a very quick and convenient option for those busy days! What’s your fantasy dinner party meal? It would have to be a supreme breaded fillet of chicken, accompanied by a creamy mushroom sauce served with champ, honey glazed carrots and parsnips. Which Northern Irish food producer would you love to collaborate with? We would love to work with Crust and Crumb located beside us in Fermanagh who manufacture pizzas. With this type of product, there is great potential for exciting new product development and flavour combinations! Tell us one thing about your products that might surprise our shoppers? There are more chickens on earth than humans. Chicken is taking over and the demand is huge as Poultry now accounts for nearly half of all the meat bought in the UK! Our products are produced using 100% Irish chicken breast meat. We are proud to keep it local. Where is Clandeboye yogurt produced? Clandeboye Yoghurt is produced in North Down, as part of the Clandeboye Estate in Bangor. Clandeboye is the only yoghurt actually produced in Northern Ireland. We have been supplying yoghurt to SPAR and EUROSPAR for about 8 years now. They are one of our most important customers, having such could coverage right across Northern Ireland. My personal favourite at the minute is our new Mandarin and Lime Greek style yoghurt, although our plain Greek Style is hard to beat. It actually won best Yoghurt in the UK this year in the Q Awards and top dairy product from a small producer! What is your favourite SPAR enjoy local product? My favourite SPAR enjoy local product is the Lemon Layered with Greek Style, really refreshing. (I also love the Madagascan Vanilla). What is a Clandeboye Yogurt signature serve? As Mentioned above our signature product is probably our Authentically Strained Greek Style yoghurt! 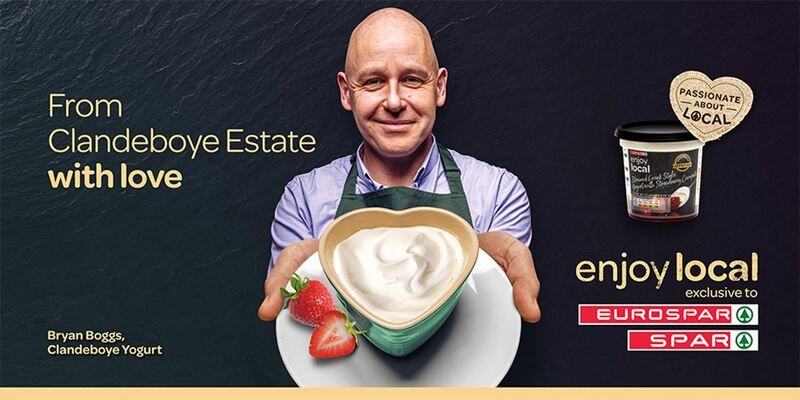 (Top yoghurt in UK in the Q Awards, Gold in the Irish Quality Awards and 3 Stars in the Great Taste Awards). Serve that up with some Granola, fresh fruit or Honey and breakfast is ready! Describe a typical day in the life of a Clandeboye Holstein or Jersey cow? Our cows are so well looked after, Mark our head Herdsman, knows every one of them by name, from Clandeboye Evita to Clandeboye Cookie. Depending on season they are either out in the fields at Clandeboye or in doors each with their own mattress in the shed beside the parlour. They are milked twice a day about 6am and 5pm. As our entire herd is pedigree some are also shown at Agricultural shows throughout the year, they get plenty of prep coming up to shows, clipped, shampooed and more! Our whole ethos on the farm is quality not quantity so adding value to the milk through the yoghurt has allowed us to stay with a relatively small herd of just 100 cows meaning we can avoid the large “Factory Farm” style of set up. Holstein cow or Jersey cow? We milk both Jersey and Holsteins on the farm and I suppose it is that bit of Jersey milk in the mix that helps make our yoghurt a little bit different, so Jerseys would be my favourite. Also they are a lot more photogenic! Tell us about Big Pot Co? What flavours have you created for the SPAR enjoy local range? The old favourites work best locally: Vegetable, Chicken & Vegetable, Potato & leek and Carrot & Coriander Soup. What local farmers and growers do you work with to create your products? I was raised on an Northern Ireland farm and am a huge supporter of our great local farmers because it’s fresher & I know exactly how it’s grown. Vegetables come from Co. Armagh producers and dairy products from N. Ireland’s largest farmer owned co-op. Where do you draw inspiration from when developing new recipes? As a food technologist my true passion is new product development. I draw inspiration from a number of sources, my kids (best critics! ), market research trends (Veganism), Diet trends (low sugar, high protein, Great local fresh raw materials, travel & eating out. Do you plan to extend the range beyond soups? Yes I’m inspired to produce fresh wholesome exciting new products to provide breakfast, lunch & tea options in convenient formats to meet time pressured busy lifestyles such as nutritious meal pots which we are working on. There is a conscious effort in the food industry to move away from plastic and use more sustainable packaging solutions. What is Big Pot Co. doing to help tackle this issue? We are working with our packaging suppliers to try and find solutions that are more sustainable which are still value for money. We are also working with Henderson’s to develop business in the serve over counters in SPARs which can be heated & served hot in recyclable packaging. Describe your ideal Big Pot Co. moment? 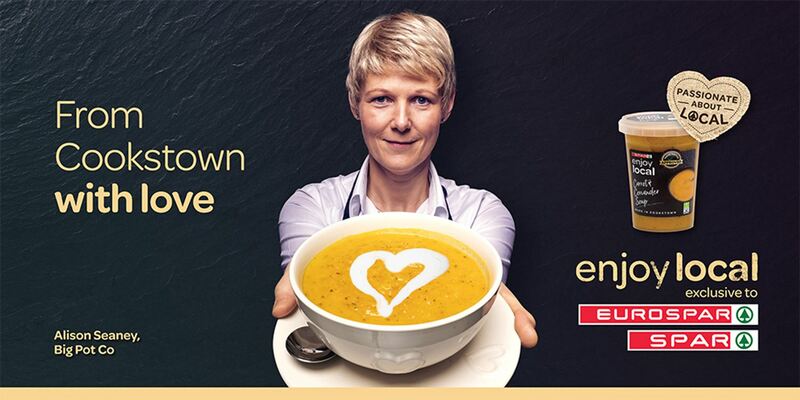 A Getting our great local wholesome soups to be a weekly staple in every household’s shopping basket! 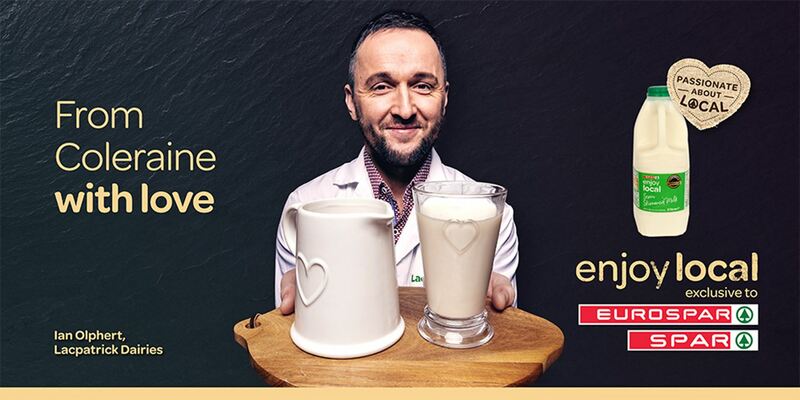 From small beginnings, with just one product and three employees, the company has expanded over the last 100+ years to include a substantial retail liquid milk business and state of the art butter production facility – which is amongst the most advanced in Europe. The Coleraine site produces a wide portfolio of high quality products: our Ballyrashane branded butter is even named as an ingredient on the packaging of many local loved food and brands. As a farm liaison officer, how closely do you work with local farmers? I work and deal with all our milk producers on a daily basis, keeping them up to date with the Red Tractor Quality Scheme. Any that are not in the scheme are guided on how to join. This is all done within a short time period and full accreditation is given in due course. We aim to have our entire milk pool/supply 100% Red Tractor Approval as soon as possible. Being part of the Liaison team, we offer support and guidance to all our producers and try to make their business/livelihood profitable and efficient . Why do you think Northern Irish farm products have become so highly sought after? The natural advantage of our geography, grass land area, water availability, air quality and quality systems are recognised worldwide as second to none. How important is the issue of provenance / traceability to your customers? Our customers are very conscious of supporting local, with ever increasing demands on the environment and keeping food miles down. Supporting our local farmers is often a key item in our customers purchasing decision. While there is a trend in non-dairy product, milk and butter continue to remain a major part of may peoples diet. That said, there is a synergy in the category and it is something that we will consider future development plans. Where do you see growth / innovation coming from in the dairy sector? Can you milk a chicken?! No, Chickens are not mammals and don’t have glands that produce milk, but… you can cook a chicken in Milk, braised its totally delicious! Do you take milk in your tea/coffee? Absolutely! It rounds off the flavour for me, it just wouldn’t be the same without some of our delicious SPAR enjoy local milk!